This rapid pace of urbanization has required some innovative plans in China. Local, regional and national policy-makers and planners are working to ensure the long-term sustainability of the country’s cities. This is a look at some of the mind-boggling statistics coming from China’s urban world. Driven by migration to cities, China’s urban population has increased by 500 million people in the past three decades – described by the Economist as “the biggest movement of humanity the planet has seen in such a short time”. This has created cities that aren’t just large, they’re mega-sized. More than 100 Chinese cities have a population of over 1 million people. For comparison, as of July 1 2015, just 10 US cities were home to more than 1 million people . 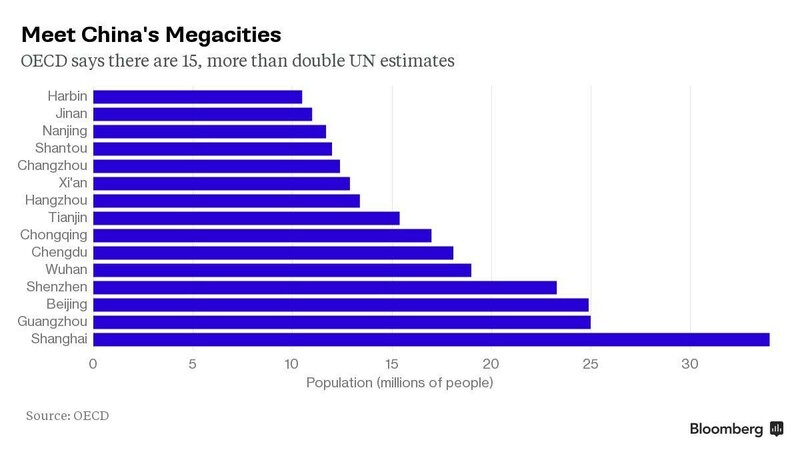 Then there are the megacities. Here the population, including satellite towns, exceeds 10 million. There are six such cities in China, according to the United Nations : Shanghai, Beijing, Chongqing, Guangzhou, Tianjin and Shenzhen. However, a 2015 OECD report puts this figure much higher, if you base it on functional urban areas, as opposed to administrative borders. 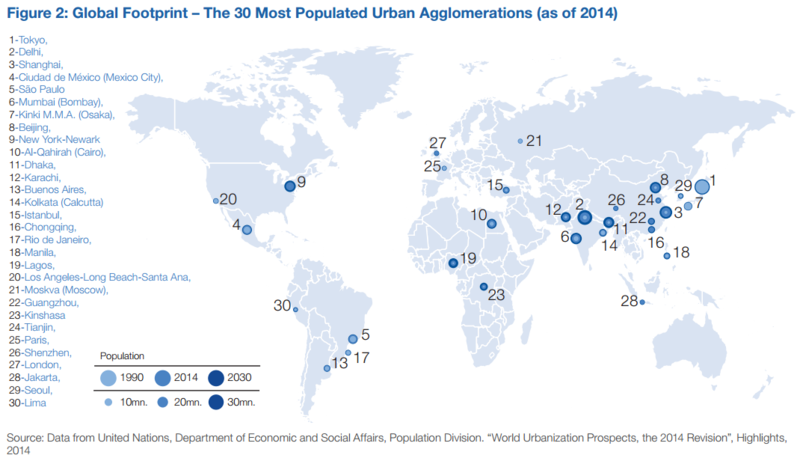 The Chinese government is also creating ever-larger urban areas . The Pearl River delta consists of nine cities, which the government aims to combine. 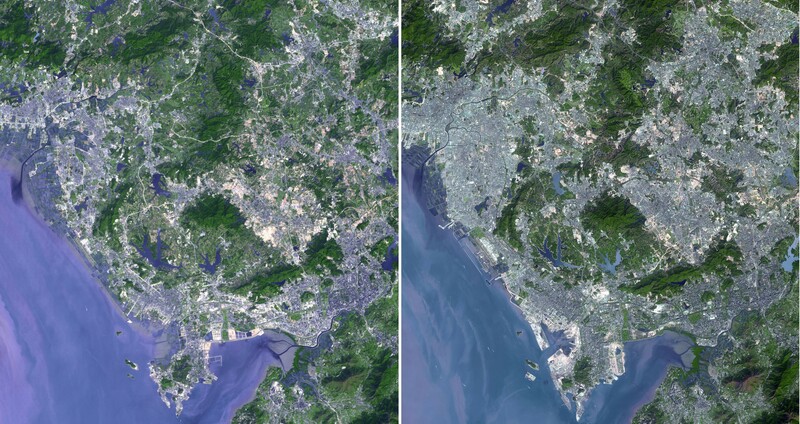 These NASA satellite images show Shenzhen in the Pearl River Delta. On the left is the city in 1999, and on the right in 2008. The increase in urbanized area is clear – all the more remarkable when you consider Shenzhen was a small fishing village as late as the 1970s. 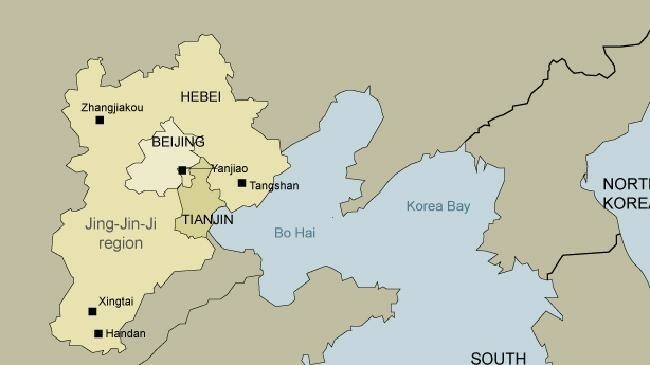 The government is also planning to create an even larger megacity, combining Beijing, Tianjin and Hebei – to be known as JingJinJi. The current population of this area is 130 million – more than the whole of Japan – and covers an area of over 212,000 square kilometres (that’s bigger than Uganda, in case you were wondering). Rapid urbanization poses significant challenges to city and state planners. Basic infrastructure from hospitals to schools and public transport is needed to cope with this rising population. Plans such as JingJinJi (Bei jing , Tian jin and the ancient name for Hebei, Ji ) are designed to spread the load. By relieving congestion in Beijing, moving polluting heavy industry away from the capital and combining the resources of the three areas, the planners hope to create a more balanced economic structure . The hi-tech industries of Beijing, Tianjin’s port facilities and the resources of Hebei would be joined by new infrastructure development. It is hoped that further urban growth can be limited in Beijing , with services moved to other areas. The World Economic Forum’s Inspiring Future Cities & Urban Services report highlights the issues faced by cities, especially in terms of sustainability. Rates of urbanization can overwhelm administrators, but understanding the challenges and putting in place adequate planning is vital to tackling these issues. These are Africa's fastest-growing cities These are the most expensive cities to live and work in What makes a 'superstar' city?